Ray Bradbury was the world’s most famous and admired writer of science fiction. Although a prolific author, he never graduated from college and was instead the product of self-education and an intense desire for learning. He set an example for all of us. You’re never too young or too old to learn and there is no telling what you may accomplish through curiosity, enthusiasm, and a desire to achieve. When he graduated from high school in the midst of the Depression, he didn’t have the funds to go to college. So he decided to educate himself and draw upon the great minds and teachers he encountered in books. For ten years, he went to the Los Angeles Public Library three days a week. 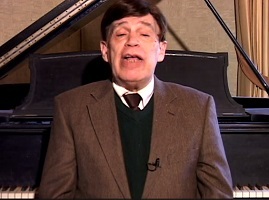 He checked out ten books per week and read hundreds of books on many subjects. 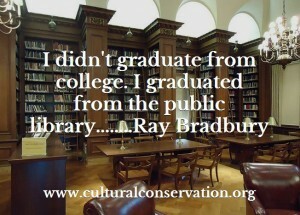 He was quite accurate when he said that he graduated from the public library, not from college. But he emerged from this intensive course of study with a vast knowledge of many subjects and a familiarity with literature, language, history, science, and the arts. Bradbury’s story reminds us that education is a continuing process; the more you learn, the more you need to know. The more answers you learn, the more questions you have. The library, whether in a building or online, welcomes everyone regardless of age or financial circumstances. You can learn something new every day! Click here!